This I shall simply call Plato’s definition of being. This memorable definition of being in Plato — the power to affect or be affected (Sophist, 247e) — has been construed by Abbagnano in terms of possibility: being is the possibility to affect or be affected. 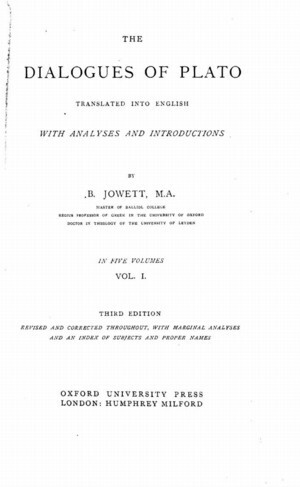 The Greek term that Jowett translated as “power” — “δύναμις” — Abbagnano translated as “possibility.” While this isn’t quite as creative as some Heideggerian “translations” of Greek, it is an unusual translation. Despite this, I count the transformation from power to possibility as justified, since the Platonic account of being does not demand acting or suffering in actuality, but only the possibility of acting or suffering. Abbagnano, to my mind, has retained the essence of Plato’s meaning. And the Platonic definition, such as it is, seems reasonable to me, as we can scarcely credit anything with being if it has no relation whatsoever to us (or to the world). Thus the Platonic definition of being so construed also provides us with a definition of non-being. 3) those which suffer only but do not act. 4) those which neither suffer nor act. This fourth possibility — those which neither act nor suffer — represents, by definition, non-being and may be considered the null permutation (analogous to the empty set). There is an implicit paradox here, since we seem to be referring to beings that neither act nor suffer, which of course are impossible. Does non-being consist of impossible beings? And there is, as well, the ontologically interesting question of the possibility of the individuation of non-beings. Nothingness has always been a philosophical puzzle, and the above approach allows us a novel perspective on nothingness. It is difficult if not impossible to imagine the utter oblivion of non-being. 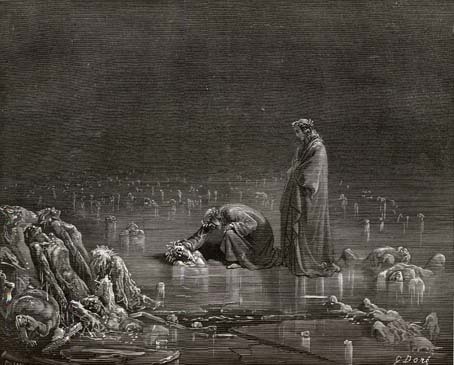 Even the sinners trapped in the ice of the frozen Cocytus are able to converse with Dante (or, at least, are merely seen encased in ice), and therefore seem possess being to some degree in virtue of this interaction. Dore's illustration of the damned frozen in the river Cocytus. It is difficult to resist observing that the ontological “inertness” which has of late been ascribed to mathematics by Jody Azzouni (and we may generally suppose this to hold for all beings, if such they be, which constitute the formal sciences) would seem to indicate that mathematics is concerned not with beings but with non-being: we do not affect the objects of the formal sciences, and they do not affect us. But this is ultimately much too simplistic: the objects of the formal sciences — numbers, propositions, etc. — affect us in so far as we conceive them, and, depending upon the philosophy of mathematics that one advocates, there remains the possibility that might affect the objects of the formal sciences, for example, by creating and conceiving them (as in a constructivist philosophy of mathematics). Azzouni's book on the philosophy of mathematics opens with a discussion of metaphysical inertness. If man is the measure of all things, as according to Protagoras, then mathematics has no measure since mathematics is resolutely anti-anthropocentric. If, as Russell held, mathematics is the study in which we never know what we are talking about nor whether what we are saying is true, this is entirely justified, because we are, as it were, talking about nothing, and what we are saying is neither true nor false. But Russell’s philosophy of mathematics exemplified a classically anti-anthropocentric position, and Russell himself was willing to formulate some of his positions in terms of non-being (as in, for example, his “no classes” theory of classes), so in this particular context Russell’s modern formulation is a re-statement of traditional view, and in his thought no suggestion of a constructivist alternative is ever made. Nevertheless, Azzouni’s account of ontological inertness does closely correspond to the definition of non-being in terms of neither suffering nor acting, and it would be worthwhile to follow up on this correspondence in a systematic way. But another time. An imaginary illustration of Protagoras teaching. And there is more. Within each ontological division outlined above we may adopt a hierarchy of being, securely based upon quantification of the number of beings which a given being affects or by which it is affected. The measure of ontological power — ontological potency, as it were — is a being’s scope of acting and suffering. Now, we may assume that those beings that both act and suffer possess a greater scope of being than those one-sided beings which act only or suffer only. Whether either one of these two inferior forms of being — viz. acting only or suffering only — ought to be superior to the other is a greater problem, and we will not address it here. We can go further than this by defining acting and suffering within regional ontologies (to invoke a formulation of Husserl). Regional ontologies themselves admit a scope of possible acting and suffering. They overlap and intersect (to invoke a formulation of Wittgenstein). The idea of regional ontologies is due to Husserl (left) while the idea of family resemblances overlapping and intersecting is due to Wittgenstein (right). A further note: construing the Platonic definition of being in terms of the possibility of affecting or being affected, as Abbagnano does, suggests a distinction between so construing Plato and, in contrast, interpreting the Platonic definition of being in terms of actually affecting or being affected. This latter interpretation would require specifying a scope of time during which a putative existent’s affecting or being affected would be relevant, for not everything affects or is affected by everything else at any one moment. But this too suggests a further division (perhaps the narrowest formulation of being) in terms of which only that which affects or is affected by a given being at a given instant contributes to its reality: call it, if you will, being at an instant. More of this at another time. It all goes back to Plato, here shown in an imaginary medieval portrait. fyi, that’s not a picture of Wittgenstein. I have changed the picture.